This narrow chairside cabinet chest adds useful storage with a mission design at a perfect size for next to your sofa or recliner. Constructed of oak veneers and hardwoods solids, the chestnut oak finish and bail hardware complement the block legs for a refreshing, transitional Arts & Crafts appeal in your decor. 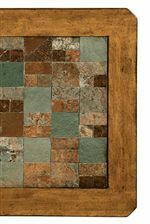 The top of the table features clipped corners and slate tiles for color with a durable surface. Storage includes one drawer, one door, and magazine storage at the back of the cabinet. The American Craftsman Oak Chairside Cabinet with Slate Tile Top by Peters Revington at Westrich Furniture & Appliances in the Delphos, Lima, Van Wert, Ottawa, and Celina area. Product availability may vary. Contact us for the most current availability on this product. Case Construction Oak veneers and hardwood solids. Metal accents on select items. The American Craftsman collection features a choice of occasional furniture in various sizes and styles for the perfect fit in your home's living room. The updated mission look of the collection comes from its mixed media design. Each piece is constructed using oak veneers and hardwood solids with multi-toned slate tiles on the table tops. Select pieces also include dark finish metal accents. The chestnut oak finish and bail hardware complements the block legs for a refreshing, transitional Arts & Crafts appeal for your decor. With the multi-purpose needs of today's modern lifestyles, functional storage is available in each piece. 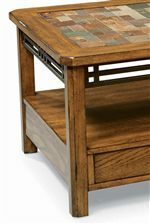 The American Craftsman collection is a great option if you are looking for Mission furniture in the Delphos, Lima, Van Wert, Ottawa, and Celina area. Browse other items in the American Craftsman collection from Westrich Furniture & Appliances in the Delphos, Lima, Van Wert, Ottawa, and Celina area.